Battling alcoholism can be the hardest thing that you ever do, but before you move forward with treatment, you must detoxify your body of all impurities. Though the process can be difficult, there are ways to go about safe alcohol detox treatment. Alcohol detoxification takes place during the withdrawal period of alcohol recovery. It is often acknowledged to be the first step of recovery. Withdrawals usually begin 6 to 8 hours after intoxication and can last for 48 hours relative to how often, and how much a person drinks alcohol. Vitamins, lots of fluids, rest and a healthy diet, are vital for safe alcohol withdrawal and it is always safer to seek help from a professional. Alcohol detox treatment is the beginning of a fresh start and is often the first step required for a healthy recovery. What is alcohol detox treatment? Treatment is a preliminary step towards recovery when a person clears their system of alcohol. It is the body’s way of removing an unwanted substance. When a person suffering from alcoholism stops drinking, they will experience withdrawal symptoms, which can be uncomfortable, painful and sometimes frightening. Detox periods can be dangerous to do alone and should be monitored by a professional so that variables like diet, fluid intake, rest, and medication is supervised. 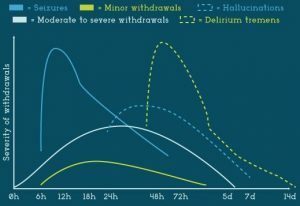 When a long-term heavy drinker (alcoholic) abruptly stops drinking, they may experience what is known as acute withdrawal–which can have severe symptoms such as delirium tremens, hallucinations, seizures, other psychotic episodes, and heart complications. Although some people experience relatively mild withdrawal symptoms, disease processes or events that accompany alcohol withdrawal can cause significant illness and death. Sadly, this list doesn’t encompass every effect that alcohol abuse has on the body, but it describes some of the dangers of alcoholism. The first stage of treatment for alcohol abuse is detox. Simply put, you have to purge it out of your system so you can move on with the recovery process. Withdrawal is not pleasant, so you must be wholly committed to recovery, or you’ll be susceptible to falling back into the grips of alcoholism. 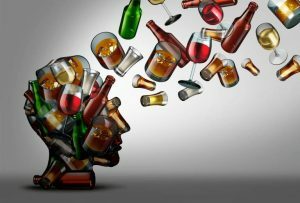 What should you come to expect during alcohol detox treatment? If you seek professional treatment, you will undergo tests that check your mental and physical health, undergo blood work and answer questions about your physical and psychological health as well as your drinking history. You will then enter the support phase, where you may be offered medication for withdrawal symptoms. The clinic will provide support for you for any issues that come up during the detox treatment process. Keep in mind that the detox phase can vary in length depending on the severity of your addiction. For some people, the treatment process is reasonably quick. Others may go through a much longer and more unpleasant process. The following chart from Industrial Psychiatry Journal makes the withdrawal process easier to understand. Alcohol recovery is never a straightforward process. Sometimes you can feel completely fine, but the next you’re suffering from a nausea attack followed by extreme dizziness. You can never truly predict the specific symptoms a recovering addict will experience during their detox. Patients receiving detoxification in a safe environment will receive medical treatment support. Pharmacological treatment is most frequently used in moderate to severe alcohol withdrawals. This may include Benzodiazepines; Adrenergic Medication; or Anti-Seizure Medication. It can be difficult to consume food during the initial stages of your detox. More likely than not, you’re going to have issues keeping your meals down. However, it’s necessary that you adopt a well-balanced diet to help you make a full recovery. Stay well hydrated during your treatment, especially during the initial stages. Your withdrawal symptoms will only intensify if you’re dehydrated. You should drink copious amounts of water even if you don’t have a desire to do so. That way you’ll be able to flush your body of all harmful toxins. At the start of your treatment, around 24 to 72 hours, you should focus on consuming soups and other liquid-based meals. If you indulge in more substantial meals, there’s a good chance you won’t be able to keep it down for long. We would recommend that you consume lean sources of protein that include fish, beans or poultry. Your soup should also include lots of vegetables. What comes after alcohol detox treatment? After you’ve successfully undergone a safe alcohol detox treatment, clients have the choice to opt-in to the therapeutic recovery program and can begin usually participating within days after detox starts. It’s not easy to recover from alcoholism, but know there are resources dedicated to helping you fight your addiction. Remember, you can only begin the path to recovery once you’ve promised yourself that you will no longer abuse alcohol, then can you move forward to a brighter alcohol-free future. If you or a person you or someone you love is struggling with alcoholism and sincerely want to get sober contact us today to find out more about alcohol addiction and treatment. How Long Does Alcohol Stay In You Body?